The YED-A429-R4-T4/USB adapter comprises of four transmitter and four receiver ARINC 429/575 channels. This rugged interface is designed to provide users with an easy-to-use full function ARINC 429/575 interface enabling the user to communicate with, simulate, test and monitor ARINC 429 equipment and systems via their Desktop or Laptop computer. The adapter is suitable for use in the lab and in the field and supports maximum data throughput on all ARINC 429 channels. All power is derived from a single standard USB port and features Plug-and-Play and Hot Swap capability. Use our proprietary Y-SIM 429 easy to use Windows Simulation, Test and Analysis software to aid project development. Y-SIM 429 provides added productivity through virtual instrument displays, chart displays, dynamic ramping data on transmit, flexible monitoring, data capture and analysis. In addition, captured data can also be replayed back out on to chosen ARINC 429 data buses for a variety of test and diagnostic scenarios. All the usual features that you would expect are available including Standard and Custom ARINC 429 Engineering units as well as the ability to save multiple test configurations to disk for use with different projects. For the OEM, develop your own software applications using our API C Library. With a few simple function calls the hardware can be up and running and processing messages to and from the ARINC 429 data buses. Function calls include routines for transmitting, updating transmit data values, scheduling, receiving, filtering, recording, time-stamping, etc. All units are designed to meet the European and US EMC regulations. Operation All of the processing of the USB message protocol, scheduling of transmitted ARINC 429 data, error checking, buffering of received data and time stamping is taken care of by the hardware, which comprises of our time proven proprietary FPGA. This allows the PC software to focus on providing a high performance interface to the user. 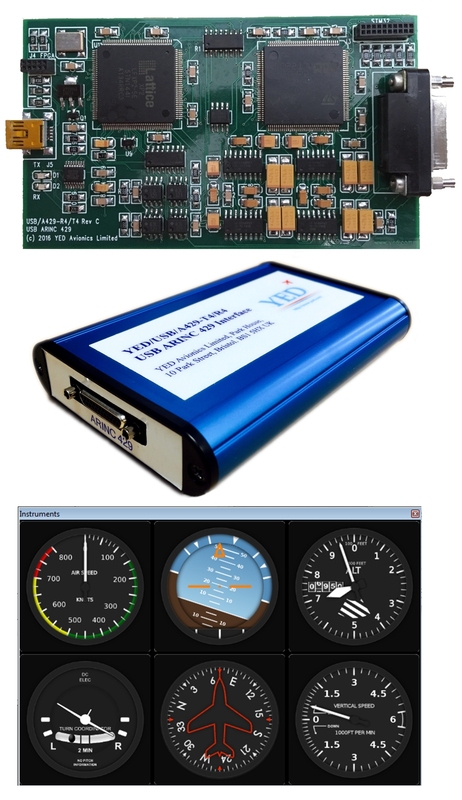 The YED-A429-R4-T4/USB adapter can operate in either Direct or Buffered Table modes for both transmit and receive on a channel by channel basis.Direct Mode would usually be used by OEM’s writing their own application software and will allow ARINC 429 data to be sent from the host PC to the adapter resulting in the immediate transmission of ARINC 429 on to the specified ARINC 429 channel(s). The same applies in reverse with received ARINC 429 data being immediately sent to the host. No filtering or scheduling takes place in this mode. Direct mode is ideally suited to performing block transfers of data such as way points and map data. Buffered (scheduled) Table mode can also be used by OEM’s and it is the mode that we use for our Y-SIM 429 Windows Simulation and Test software. In this mode the host sets up a table of ARINC 429 data to be transmitted and/or received (filtered). ARINC 429 scheduled transmission comprises of the standard minor and major frame type cyclic transmissions found in ARINC 429 today. These transmissions intervals can be from 10ms up to 1.28s intervals. For ARINC 429 reception, received data is compared with uploaded filter tables and if the criteria matches the data it is then transmitted to the host. In addition, received data can also be sampled by the hardware prior to passing it to the host PC. This can be used to decrease the frequency of specific ARINC 429 labels from being sent to the host, thus reducing the amount of data being received by the host. The receivers automatically adapt to the incoming bits rates for high (100 kbps), Medium (50 kbps) or low (12.5kbps) speed data. ARINC 429 Parity is checked automatically for ODD parity on receive and calculated by the FPGA to be ODD parity on transmit. The adapter can be programmed to set a channel to either ODD, EVEN or NO PARITY – the latter meaning that Bit-32 is available for use by the user. Sub-licensing This product is also available in custom defined formats. For example it is possible to supply the STM32 processor and / or firmware, pre-programmed FPGA and supporting documentation for inclusion directly into a customer's product. This is provided under license. See A429-STM32 page and YED/A429-R8-T8-FPGA page for further information. We would be interested to hear of any special requirements that you would like to see added to this product. Connection via a SMT USB TYPE B Connector. ARINC 429 interface via Micro D25 with standard D25 adpater cable. Direct serial to ARINC 429. Direct ARINC 429 reception to Serial. Opto-coupled receivers permitting electrical isolation and excellent EMC performance. All intelligence & bus timing handled by the module relieving the user from this responsibility. Receiver automatically adapts to incoming bit rate. Industry standard ARINC 429 line drivers. Out-of-the-box easy-to-use full function USB to ARINC 429 interface. Simple 5-byte command serial interface to control the module. Powered from USB port (@300mA Max). After installing the required Device Drivers for your host environment (details in the user manual), this demo utility allows the user to connect the module to their PC and exercise the various features. By connecting Tx and Rx loop back connections it is possible to receive your own transmitted data and even record this to a disk file for analysis.